Boston 1775: Carp on Resolute Men and Mohawks at Old South, 12 Dec.
Carp on Resolute Men and Mohawks at Old South, 12 Dec. The people finding all their efforts to preserve the property of the East-India company, and return it safely to London, frustrated by the tea consignees, the collector of the customs and the governor of the province, dissolved their meeting.—But, behold, what followed! 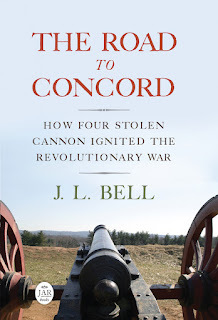 A number of resolute men (dressed like Mohawks or Indians) determined to do all in their power to save their country from the ruin which their enemies had plotted, in less than four hours emptied every chest of tea on board the three ships commanded by the captains [James] Hall, [James] Bruce, and [Hezekiah] Coffin, amounting to 341 chests, into the sea! without the least damage done to the ships or any other property. The masters and owners are well pleased that their ships are thus cleared; and the people are almost universally congratulating each other on this happy event. Eventually that “happy event” became known as the Boston Tea Party, of course. And, as the latter-day illustration above shows, the “Mohawk” disguises have been a crucial part of that story. What does historic evidence tell us about these disguises, and what misconceptions linger? 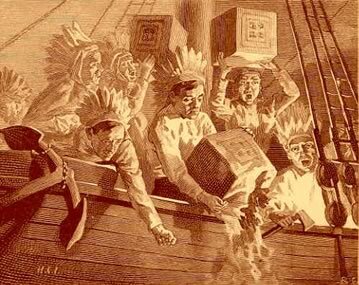 Learn why Boston Tea Party participants selected Native American, and specifically Mohawk, disguises, and what this aspect of the Boston Tea Party can tell us about the emerging identity of Anglo-Americans in eighteenth-century Boston. Ben Carp’s lecture will begin at 12:15 P.M. Admission is free for Old South members, $6 for others. A book-signing will follow.